Finally, I’m all caught up. I need to plan less things to do on Thursdays. Anyways, this week’s episode starts with a reporter at Iori’s mansion who is trying to report about Iori’s father, but she tries to promote herself and 765 Pro. 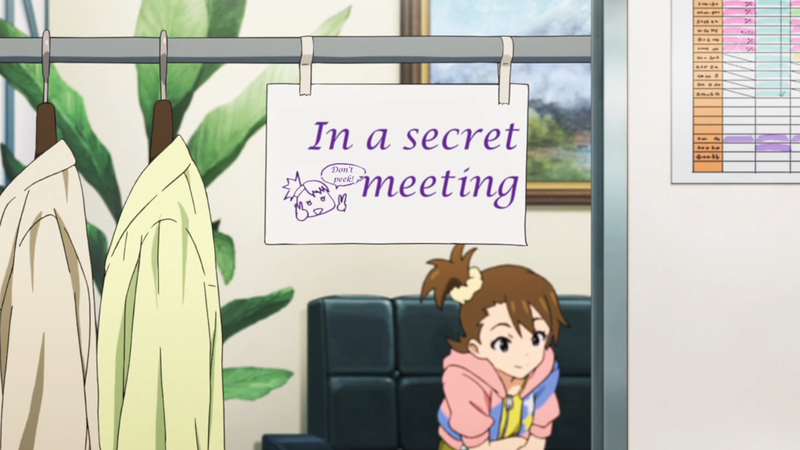 Later, Iori and Hibiki decide to go to Yayoi’s house for dinner. They all go shopping and Iori shows off how spoiled she is at home. They finally reach Yayoi’s house, where they meet all of her siblings. 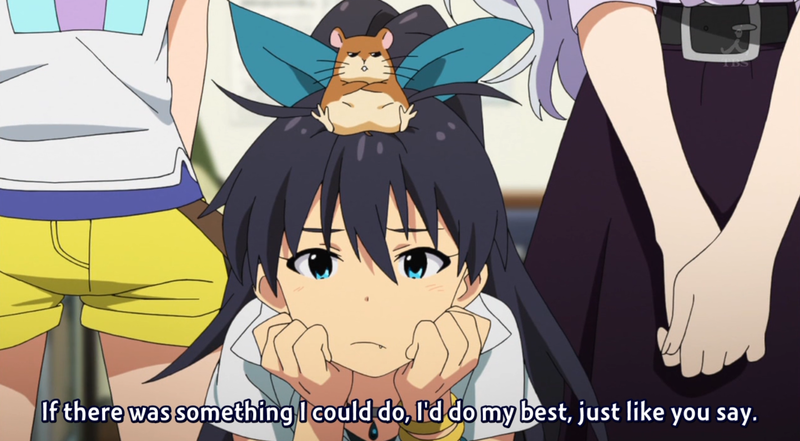 Hibiki hits it off well with them and even Iori starts to enjoy herself. Iori talks with who seems to be Yayoi’s eldest younger brother, who tells her that he likes to help Yayoi out whenever he can because she’s so busy (aww). They all sit down for dinner and, after a short interruption from a blown fuse, dig in. Iori is hesitant at first because they’re only eating beans, but starts to enjoy it when she finally tries it. The eldest brother Chousuke gets angry at Yayoi when she lectures him for hitting his brother for trying to take his food, though, and runs off. 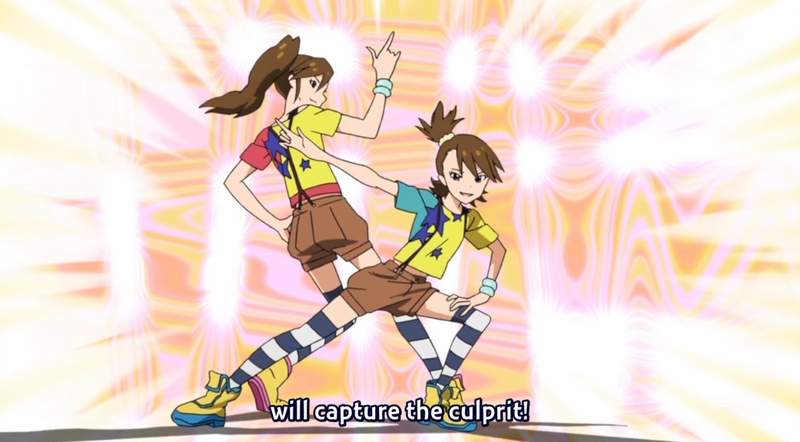 Iori and Hibiki manage to convince Yayoi to go after him and search for him. 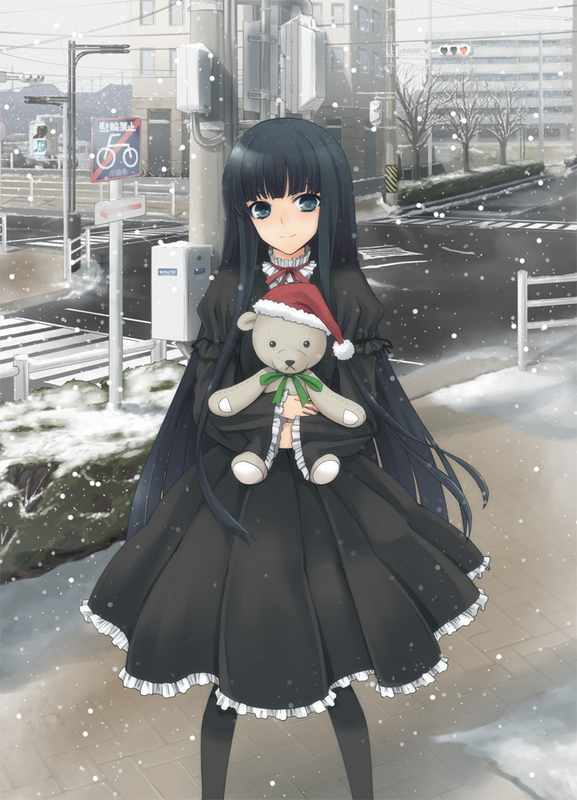 Yayoi and Hibiki are unable to find Chousuke and Yayoi begins to worry, but the Producer appears to comfort her, having been called by Iori. 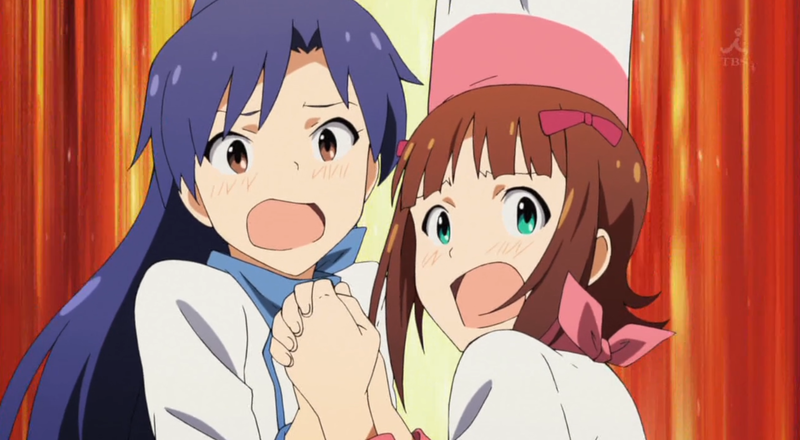 After talking with the Producer, Iori realizes that Chousuke is still hiding in the house and finds him in the shed. She talks with him, comparing him to herself, and makes him realize that he shouldn’t be running. After a touching reunion with Yayoi, the rest of the gang starts to head home. Kind of a cute episode. Why doesn’t Iori have pigtails? Sigh…way to bust the stereotype. Anyways, apologies for the tardiness of these posts, but I think I managed to get them done in good time. We start this episode with a broken air conditioner at the studio, which triggers a trip to the beach (the obligatory beach episode!). We (the audience) are treated to random scenes on the beach with all of the girls, as well as an insert song (which sounded pretty good to me). 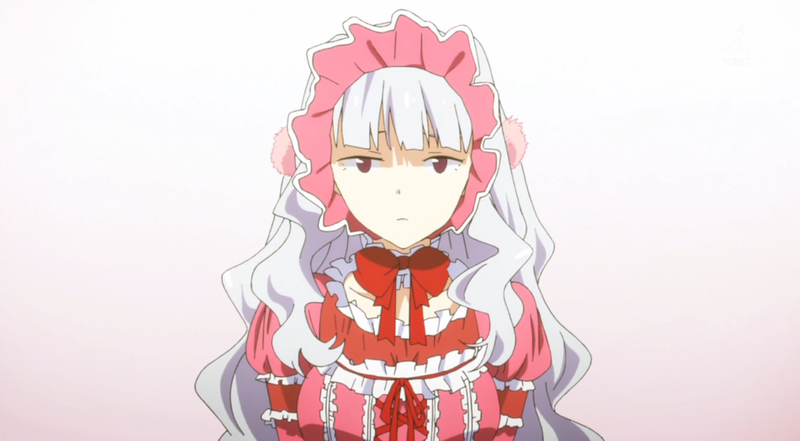 Takane also shows off her impressive eating capabilities (what an intriguing character). After a long day at the beach, the girls go to stay at an old-fashioned inn. They chill, have an outdoor barbeque, and shoot off some fireworks. 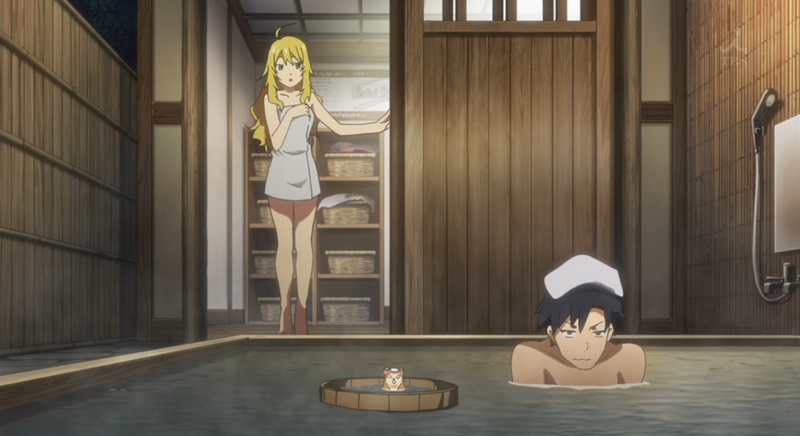 Afterwards, everyone goes to take a bath. The Producer, being the only guy, gets a nice bath to himself and Hamzou. Or so he thinks, as Miki walks in. The rest of the night, the girls talk and bond, but not too much else happens. But then again, it’s a beach episode, so just sit back and enjoy. When they get back, the President announces a new mystery project called Ryuugyuu Komachi (wonder what that is). Anyways…not much to say. Onward! In this episode, some of the girls go on a show called Kero Kero Kitchen. 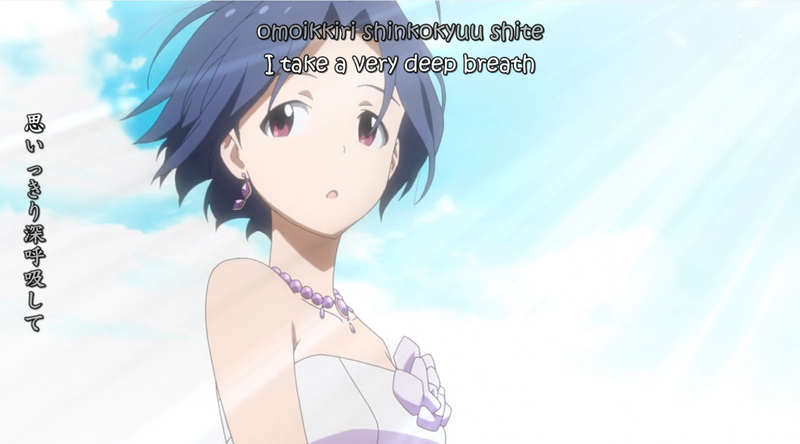 The show is sort of a battle of chefs, which disappoints Chihaya because she had wanted the chance to sing. Her performance ends up being lackluster and she disappears during the commercial break. 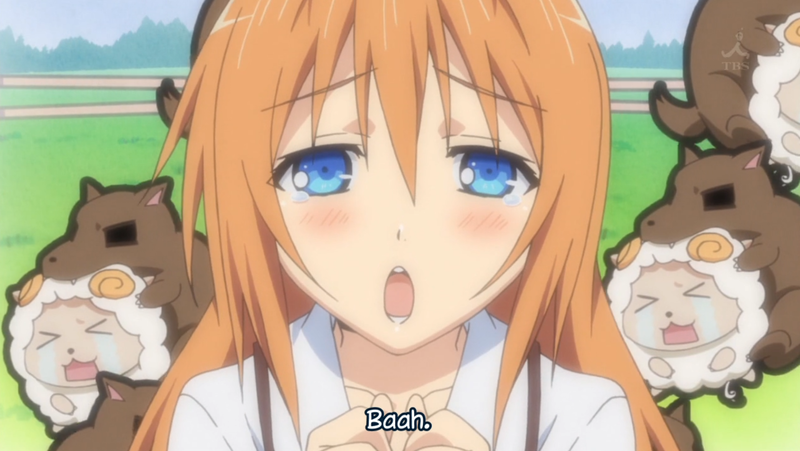 The Producer is able to find her by herself singing. After talking with the Producer, Chihaya decides to give the cooking show another try. Chihaya and Haruka don’t end up winning (I dunno how the judges decided when they didn’t eat the dishes), but the show ends up turning out well. I was kind of expecting the Producer to do something extravagant at the end like show up at Chihaya’s house with a bunch of the girls (Chihaya lives alone), but nothing like that happened. Oh well. It looks like next week is the obligatory beach episode, though. Alright, so in this episode, the Producer (who still hasn’t been named) gets the girls a job, the first one he’s been able to get for them. However, it turns out to be in a small town. 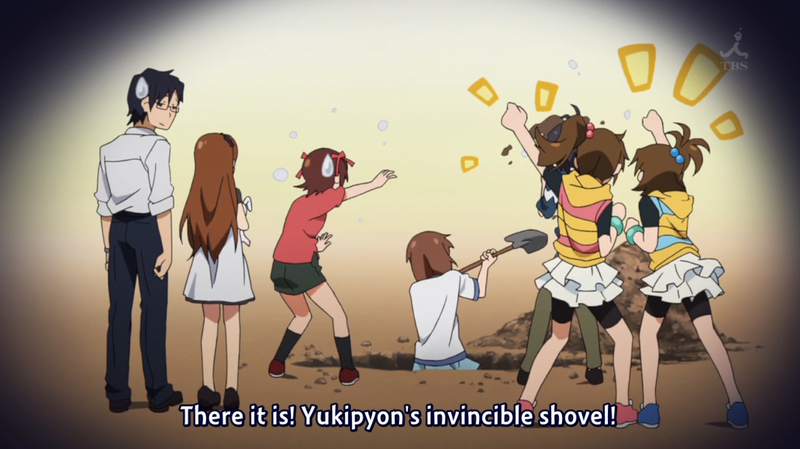 This episode seems to focus on Yukiho, who is afraid of men (even the Producer). She also reveals that she’s afraid of dogs as well (yeesh, what a pain). She’s able to get past all of these (with a little help from the Producer) and get on stage, though. She even finds out something about the Producer’s fears too. The event turns out to be a success, and the everyone makes the long trip back to the studio. So, I guess this show is gonna go through each of the girls and their individual issues or something? I dunno, but I’ll keep watching to find out. So this week, we get to see more of the feminine side of Subaru, as she is forced by Kanade to go out on a date with Jirou to help get him used to being around girls. Mostly, this episode is about the two of them bonding. 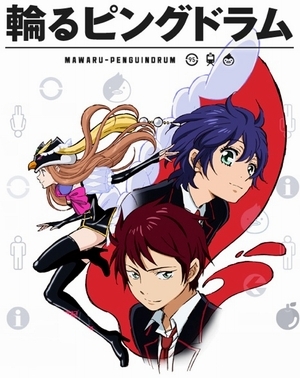 In this episode, the boys start out on their journey to find the Penguin Drum. Their strange benefactor tells them that there is a girl that is suspected of having it and they spend the day tailing her. 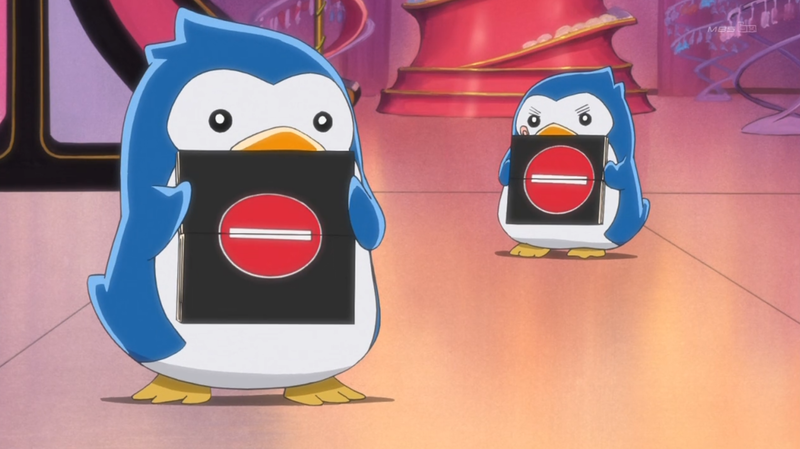 The coolest part of this episode is definitely the penguins, which the boys use to do reconnaissance because they can’t be seen. Also, did I mention that the opening and ending themes are amazing? 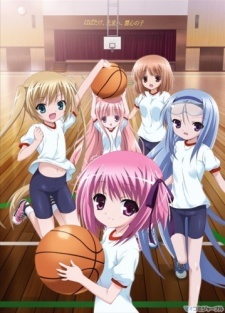 In this episode, they focus more on the younger girls while they redo a photo shoot. Not much to say about it. Mostly just goofy behavior and stuff.